On Friday of last week,I went to the live of Miss Ayano Tsuji. Ayano was scheduled to perform the live in the festival at the previous night named "Slow Music Slow LIVE '07 in Ikegami Honmon-ji Temple".I was excited because I would be able to listen to her music in the place of temple.By the way,The other performer except Ayano is as follows. 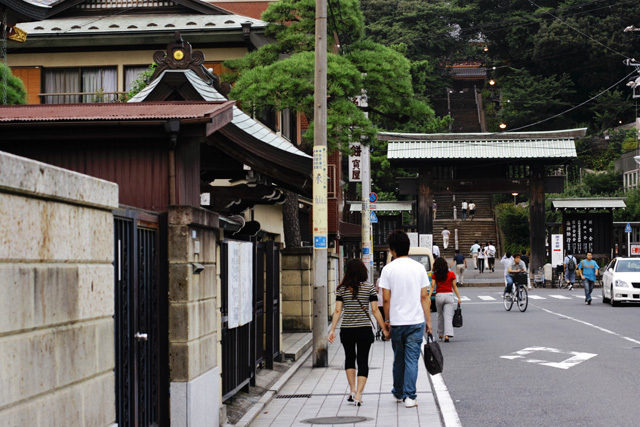 The place of today's live is Ikegami Honmon-ji Temple located in 10-minutes distance on foot from Ikegami Station.After I bought a cable release mentioned the previous diary,I went to Kamata Station on Keihin Tohoku Line and I transferred from its Line to Tokyu Ikegami Line and finally,I arrived at the Ikegami Station on Tokyu Ikegami Line.A row of houses around the station is very old on the whole and their houses had produced a quaint atmosphere. When I went through the gate of temple,I could see the main temple.I quite sweated to climb stone stairs.If I would come from NISI-MAGOME Station,I might not have had to climb this stairs. Oh!? 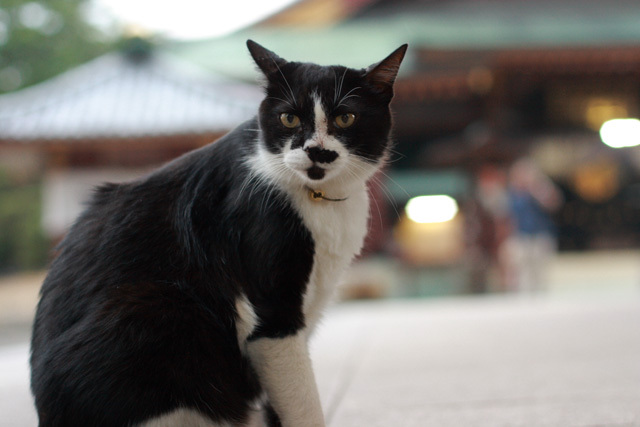 I discoverd a cat near the main temple!! The cat approached me without a caution. 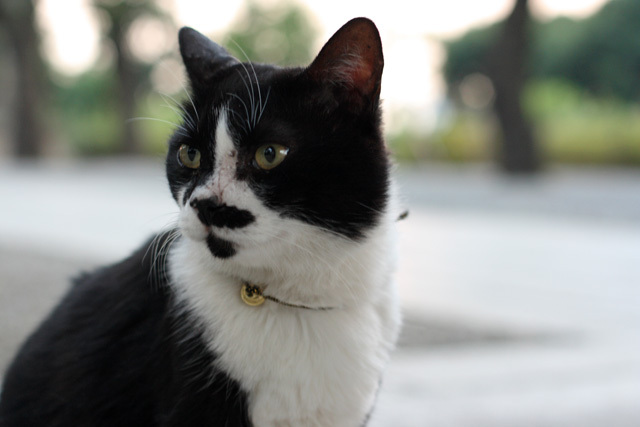 This cat looks like stern in the photograph, but this cat was really so cute and friendly. I arrived at the live hall at about 18:30.As soon as I arrived there,aluto's performance just began.Hereafter, a left photograph is an appearance in the live hall.A left photograph is shown the seat called "RAKURAKU Seat".As I had bought a little expensive ticket,I could watch the live relaxedly while eating and drinking!! As 19 o'clock approached,the illuminated five-storied pagoda came to look beautiful and the moon was shining behind it.I hadn't almost went to the open-air live of the night,but the atmosphere settled down very much and I was comfortable to get a light breeze. The artist called "aluto" performed as an opening act in the festival of the night before. 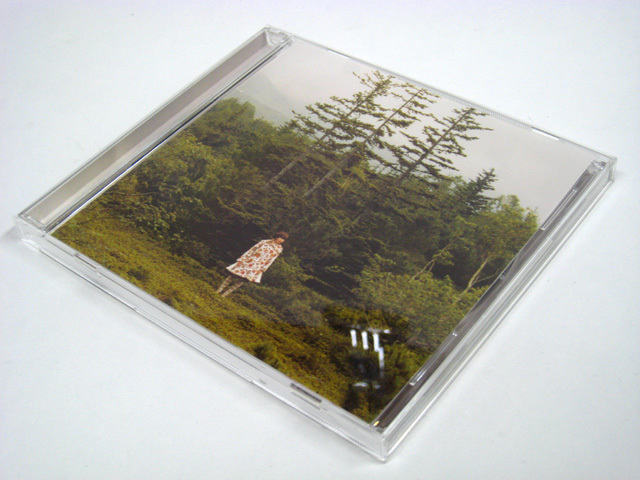 "aluto" consists of 2 people,a man in charge of vocal and guitar,and a woman in charge of violin.I listened their music for the first time at that time,but I thought they were quite good.In particular the sound of the violin was comfortable to my ear. 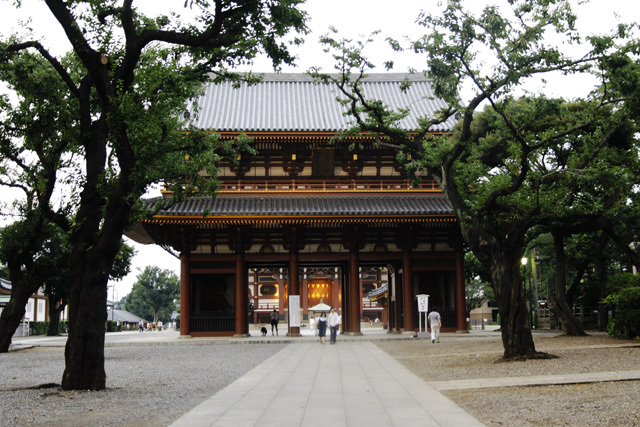 After aluto's performance,about 5 minutes preaching by the priest in Honmon-ji Temple began (I was very bored). When it became 19 o'clock,Hanako Oku that I made it to the purpose next to Ayano appeard at the stage. As I hadn't seen her live before,I had looked forward to watch her. She sang to her own keyboad accompaniment.3 song from her 2nd album,and the song that I hadn't listened was 2,unreleased song was 1,so it was 6 in total. A New song called "Meiro" moved me deeply.When I was into Hanako Oku's world completely,she sang a last song called "Koi".While I was listening this song,2 middle-aged men sitting behind my seat began to talk each other in a loud voice.I had stand the noise at first.But their conversation was too loud and they didn't stop talking for one minute or more,so I couldn't concentrate her song gradually.As I was already exhausted to them,I followed friend of mine Mr.Nori and I said them angrily "You're very loud!" So,they became silent at once.Normally,I have stood the audience who had a bad manner,but I thought that I should warn such people without hesitation. Some people begin to make noises in the live that various artists perform if they aren't interested in the specific artist,but others concentrate to listen to music,so I want them to think about the other's troubles. In particular,Hanako Oku's song is almost ballade and let me listen quietly,I think. Taking heart,the next turn of Hanako Oku is Ayano at last!! The first song was "Tsuki" from her album "CALENDAR CALENDAR".It was the best selection while the moon was seen behind the live hall.She performed in a quiet with an ukulele.The 2nd song was called "Tanpopo" in acoustic. In the third No. "Clover",Her band members appeared.keyboad is "Kazuya Saka" and Woodbase is "Wataru Iga" ,which are very familiar to Ayano fan.This time,I thought that the arrange of "Clover" was diffrent from usual ones. The 4th No. was called "Aino Manatsu".I have listened to its song many times in her live,but that's good to listen it after a long time.Though,it seemed that she was hard to sing a Chorus.There was a moment that her voice was reversed once.Even so,it's good selection exactly in summer. The 5th No. was called "Kitto Ieru",which is the cover of the artist "Yu-min".I listend this song for the first time and my first impression wasn't good so much.she said she had sang it about 2 years ago. The 6th was "Darlin",which is a well-known song by CM of Dynam.At first it began in acoustic,and it joined woodbase from the chorus.It sounded and extended in the chest. The 7th was "Sayonara Aisiteru".At her one-man live of last autumn,She had sang this song as a last song before encore.An air that the live was likely to finish was breathed and I came to become sad voguely. The 8th was unreleased new song which don't have a name yet.That song is on the theme of the birthday.Particular impressive was the last phrase "Sweet～Happy Birthday～♪".This phrase remains in the ear even now. Final artist was "Shione Yukawa".She's from Tokyo and was born in 1983(now,23 years old?) she had taken charge of soprano in the chorus group of the boys and the girls since elementary school.She had experienced many performance overseas and in 2005,she performed as the actress in the movie called "Linda Linda Linda" and She sings herself in the movie. I heard of this artist for the first time on that day.Although I didn't expected her,I thought what a unique and wonderfull she was!! Her clear voice was beautiful and the higher pitch sound sounded and extended in the live hall.I was fascinated to listen that her voice resounded like an echo. In the last song "Kiruto",she ended her performance by singing a capella.The live hall was encompassed by a breathtaking silence and I felt as if I traveled in Switzerland. After the live finished,I bought 2nd mini album "Waltz of the snow" of Yukawa Shione at the goods shop.Though I listend her music after I went home,I thought the live was far better than CD.At the Tsutaya,I rent her album titled "Shione Yukawa" too. 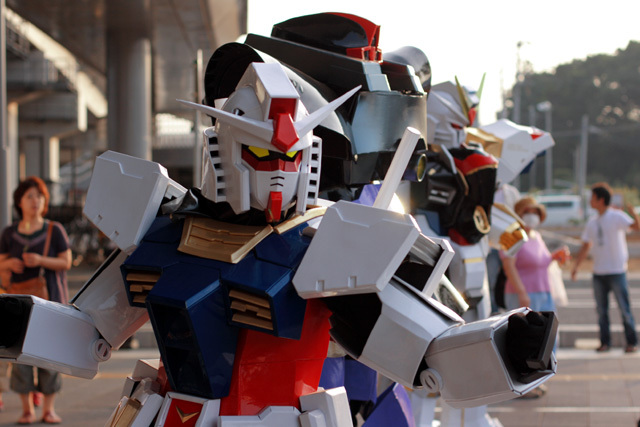 Next day,when I arrived at the local station,the festival called "The second anniversary of Tsukuba Express" was holding.As I wasn't interested to it, I was going to go home.But no matter how I see,mobile suit like a gundam reflected my eyes.Oh! thank God!! 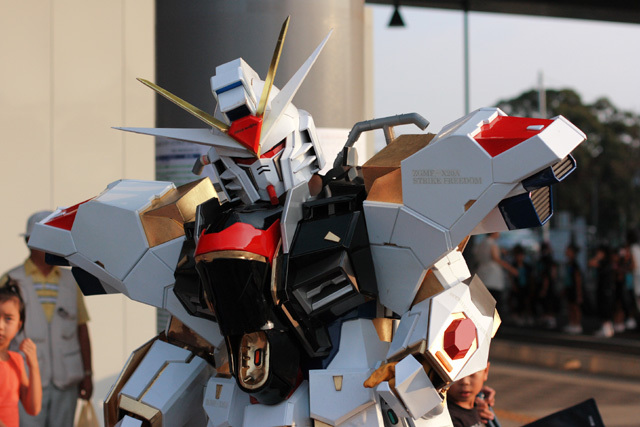 I can see "Strike Gundam"!! 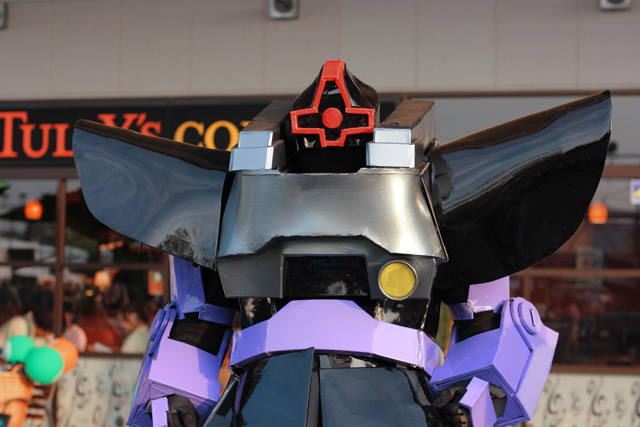 As a gundam was very cool,I took a photograph in the low angle too. 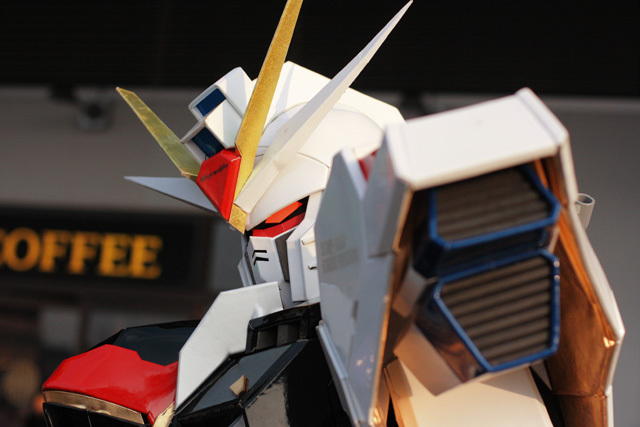 The 1st gundam posed for me when I turned my camera to him(? ).Even so,This is made well! 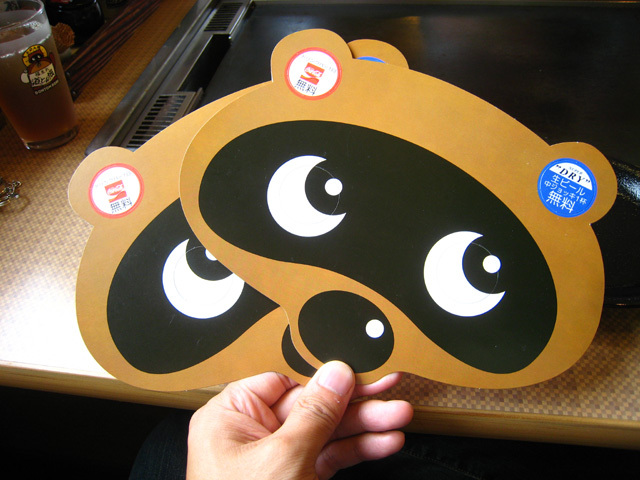 At around the station,I bought a key ring of the local station that the period was limitted.It comes to want to collect such a this thing,don't you?